The nearly full moon peeks through the clouds near the Roman Catholic Church of La Sagrada Familia, in Barcelona. Miguel Claro is a professional photographer, author and science communicator based in Lisbon, Portugal, who creates spectacular images of the night sky. As a European Southern Observatory photo ambassador, a member of The World At Night and the official astrophotographer of the Dark Sky Alqueva Reserve, he specializes in astronomical skyscapes that connect Earth and the night sky. Join Miguel here as he takes us through his photograph "A Twilight Moon in La Sagrada Familia, Barcelona." A twilight scene shows a 96 percent illuminated moon peeking through the clouds behind the Roman Catholic Church of La Sagrada Familia, in Barcelona. Being the most visited landmark in Spain, the Church of La Sagrada Familia was inscribed on the United Nations Educational, Scientific and Cultural Organization's (UNESCO) World Heritage List in 2005. The unfinished church has been under construction for 136 years. Designed by Catalan architect Antoni Gaudí (1852–1926), it was his most important and ambitious work. When the basilica's first stone was laid on March 19, 1882, Gaudí thought it would take only 10 years to build the church.After 136 years of construction, only 70 percent of the basilica is finished. The construction is now in its final phase as workers build six central towers that will stand as tall as 560 feet (170 meters). 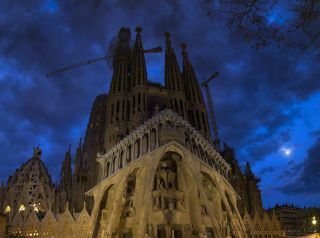 "When its tallest tower is finally completed in 2026, for the centennial of Gaudí’s death, the basilica will become the tallest religious structure in Europe, the tallest building in Barcelona and the tallest church in the world," The New York Times reported. Editor's note: If you captured an amazing astronomy photo and would like to share it with Space.com for a story or gallery, send images and comments to managing editor Tariq Malik a spacephotos@space.com.